Complete downloading the demo software (link at the end of the manual. 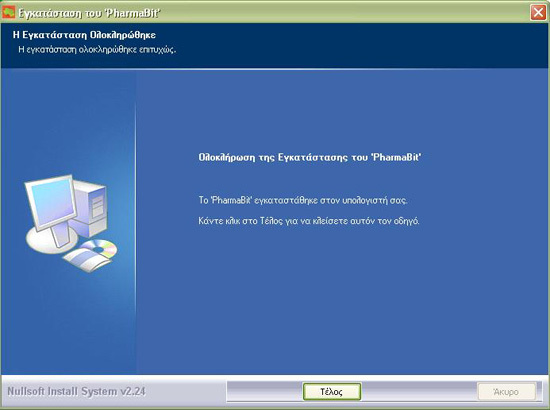 The software installation process, starts by double-clicking the icon PharmaBIT Setup. On the appearing screen, choose the command “Next” (Picture 1). By choosing the command “next”, appears the window seen on Picture 2, where you can choose the command “Install”. The software is now under the installation process, that may last a few minutes. 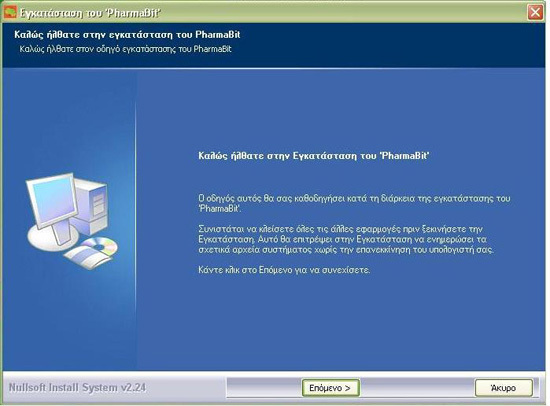 When the installation is completed, then appears the window seen on Picture 3, where you choose the command “End”. The demo is now installed and the software icon has appeared on your desktop. By double-clicking on the icon, the window of Picture 4 opens, where you must choose the button “Demo Use”. 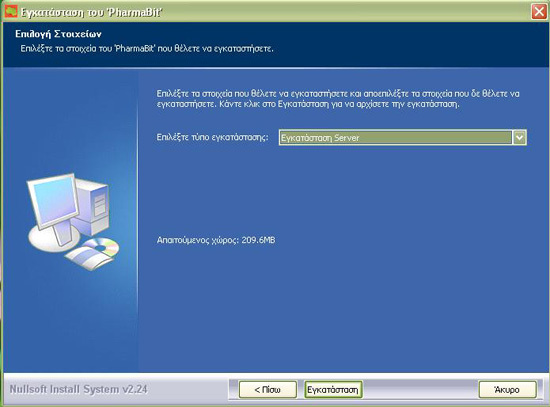 On the main screen that appears, choose from the software menu, the button “Internet” and then choose “Update Database”. This option enables the integration of the products that already exist in the regular version of Pharma BIT, since the products that exist in the demo version of Pharma BIT are indicative and in no case updated with the latest upgrades. To complete the products’ integration process on the demo, choose the command “Complete” (Picture 5). 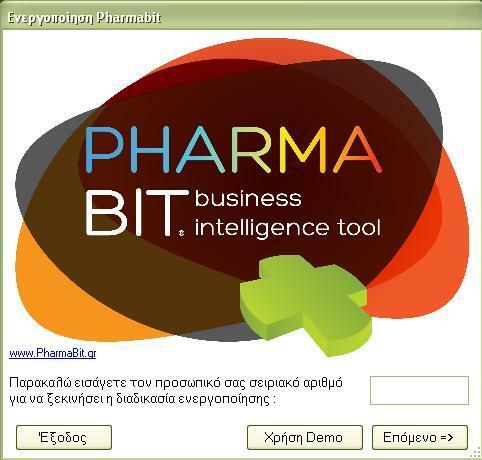 The last stage, in order for you to manage Pharma BIT’s environment has to do with the movements’ import in the software, which simulates the import from your commercial program to Pharma BIT, so that you can manage the reports concerning sales, purchases, inventory and profitability. To do so, choose the button “Import Movements” from the software menu and press “OK” (on the demo version there are some “pilot” moves in order for you to run reports). Finally, choose the command “Complete” (Picture 6) and the software is ready to use. For any clarification regarding PharmaBit’s operation, please either refer to the manual that can be found on the menu of the software, or contact our company K-Provoli, tel. +30 210 2715032. * The file is compressed in zip format. 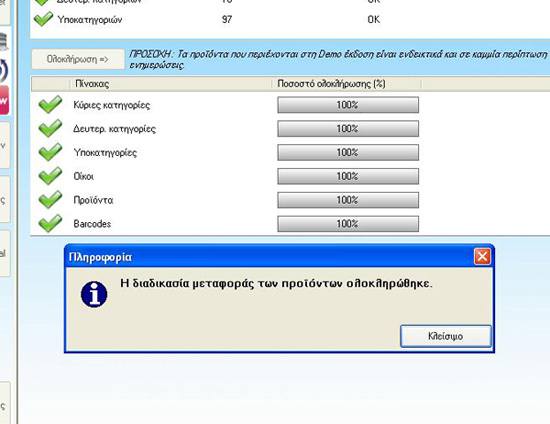 For decompression, if you do not have a suitable program on your computer you can use winzip. winzip.